Yesterday, we had a few drops of rain in the late afternoon. We had quite a bit of wind as well, gusting to 25 mph as the storms passed nearby. I did get a photo of the mammatus over the Sandias as the storms moved east. This morning has been mild, sunny and still. It has been almost chilly, and I almost wish I brought a jacket. The NWS in Albuquerque, NM, forecasts (for Rio Rancho, NM) a sunny day, with a high temperature near 89 F. Winds will be calm, becoming 5 mph from the southeast in the afternoon. Tonight will be partly cloudy, with a low temperature of 59 F. Winds will be from southeast at 5-10 mph, becoming northeast after midnight. 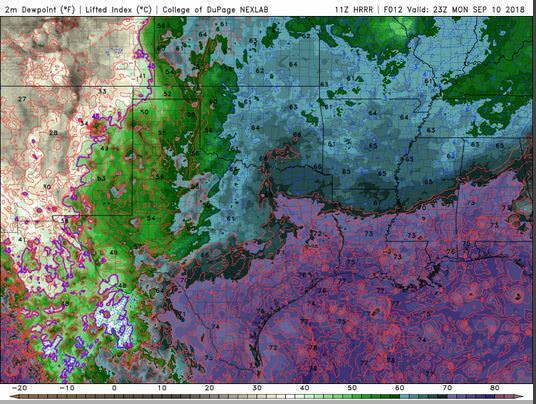 The NWS in Albuquerque, NM, forecasts (for Socorro, NM) a mostly sunny day, with a high temperature near 92 F. The winds will be from the northwest at 5 mph, becoming east in the afternoon. Tonight will be partly cloudy, with a low temperature of 61 F. The winds will be from the east at 5-10 mph, becoming south after midnight. The NWS in Albuquerque, NM, forecasts (for Magdalena, NM) a mostly sunny day, with a high temperature of 84 F. The winds will be from the northwest at 5 mph, becoming east in the afternoon. This evening will be partly cloudy, with a low temperature of 56 F. The winds will be from the east at 5-10 mph, becoming southwest after midnight. The NWS in Albuquerque has issued a Hazardous Weather Outlook concerning a few thunderstorms along and east of the central mountain chain. The visible satellite imagery shows very few clouds over the state this morning. This image has been excluded from today’s post. The 12Z upper air sounding from Albuquerque shows a moderately humid atmosphere this morning. There was 0.63 inches of precipitable water present in the column this morning. 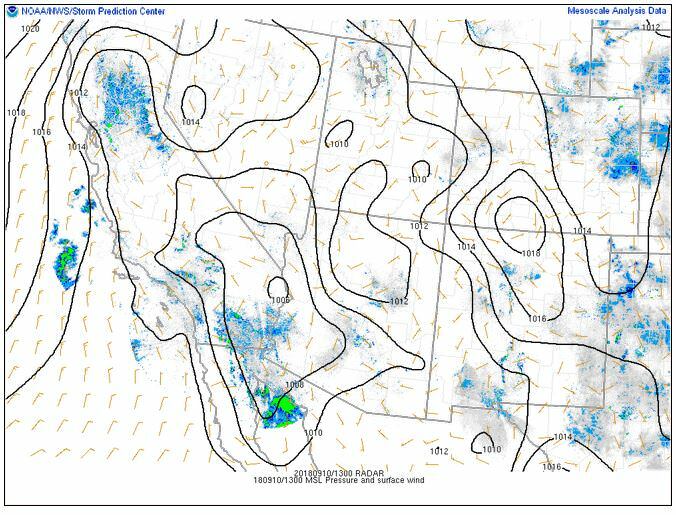 There was 4 J/kg of Convective Available Potential Energy (CAPE) and -651 J/kg of Convective Inhibition (CINH). 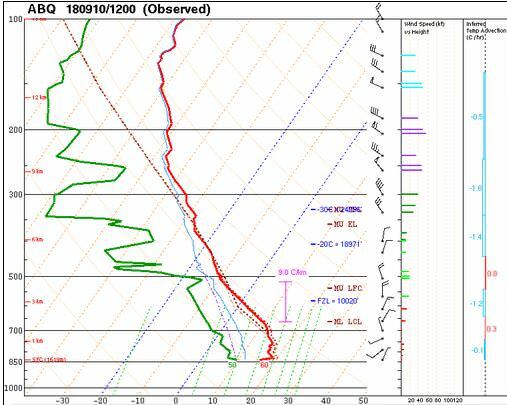 The Lifted Condensation Level (LCL) was 770 m. There was a small thermal inversion near the surface, and the 0-3 km average lapse rate was 5.1 C/km. 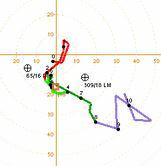 The hodograph shows that there was 7 kts low-level shear (due mostly to directional changes) and 7 kts deep-layer shear (due mostly to directional changes). 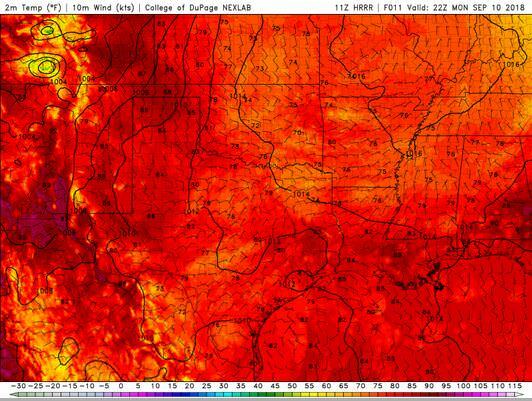 The surface observations (from the SPC Mesoscale Analysis Map) show mild temperatures and moderate humidity (based on the surface dewpoint depressions). The skies are sunny and the winds are light and variable. The surface pressure chart shows no strong pressure systems or gradients over the state this morning. The RAP shows that the high pressure system will weaken with diurnal heating over the next six hours. No strong pressure gradients are expected over the state today. 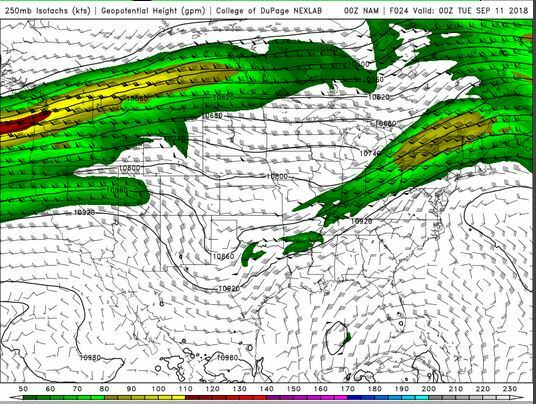 The NAM 250 mb chart shows northerly flow aloft as the shortwave trough deepens over Texas. It will be interesting to see how this trough interacts with the approaching hurricane in the Atlantic. The NAM 850mb chart shows no strong thermal advection over the state today. This image has been excluded from today’s post. 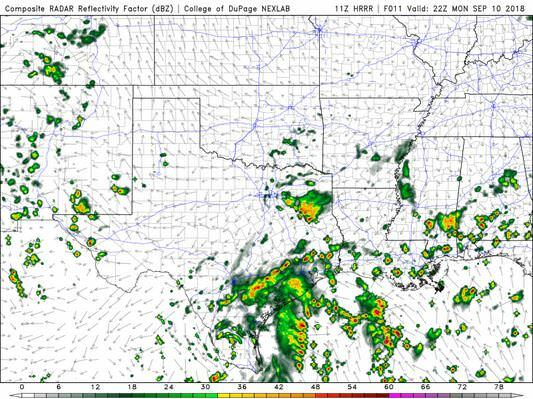 The HRRR simulated reflectivity shows a few showers and thunderstorms this afternoon, maybe even a few over the Albuquerque Metro area. Coverage will be more sparse than yesterday. 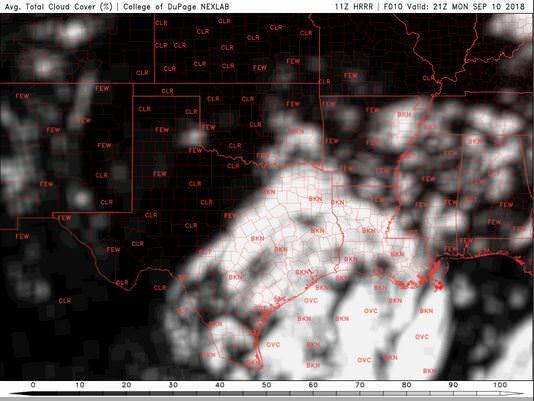 The HRRR predicts that the high temperatures for the Rio Grande River Valley will peak around 22 Z, reaching into the low-90’s F.
The HRRR shows that today will be drier than yesterday, with dewpoints dipping into the upper 20’s F.
The HRRR shows that strong winds are unlikely today. This image has been excluded from today’s post. The HRRR shows that the skies will be mostly sunny all day, with a few clouds in the evening. Today will be hot, moderately humid and sunny day today. I would not rule out an afternoon thunderstorm, even as far west as the Albuquerque Metro area. The upper air soundings and mesoscale analysis plots are from the Storm Prediction Center website. This entry was posted in Local WX, Photography, Practicing Concepts, Predictions, Satellite Imagery and tagged albuquerque, Belen, forecast, Los Lunas, magdalena, mammatus, New Mexico, nmwx, photography, rio rancho, Socorro, weather. Bookmark the permalink.